The creators at Film Impact have released a new pack of ten dynamic transitions for Premiere Pro just in time for the 2015 release. These transitions bring with it 3D movement, glows, glitches, flares, mattes, and much more. I’ve been using Film Impact transitions since their inception, and have all three packs in my collection. These transitions add that extra piece of pizzazz without being over the top. I had a chance to play around with these new transitions and see their capabilities. The four transitions below are some of my favorites. Impact Solarize is a transition which takes the incoming and outgoing clip, blends them with a tinted invert and glow effect, then dissolves between them. In the Effect Controls, you can control a variety of parameters such as the glow, width, RGB values, contrast, and dissolve length. I’ve used this transition on recent video projects and it really flowed with the presentation and feel I was trying to establish. Overall, I like that I can change the colors and impact of the glow to get a unique look of my own, or I can use the default setting as is. Impact Wave is a transition that makes a wave like motion between your incoming and outgoing clip. I like to think of this transition as a combination of a zoom blur and a cross dissolve. 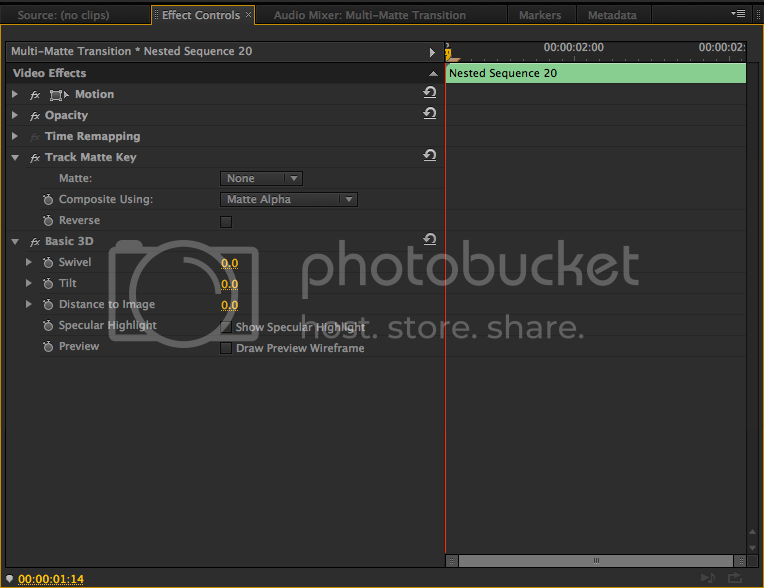 With this transition, you can control the angle, motion blur, amplitude, colorization, and length. I haven’t seen anything like this from other vendors offering third party transitions. It’s very smooth and straight to the point. I highly recommend using it. Impact 3D Roll is a transition that rolls your incoming and outgoing clip into a cylinder like motion. You can choose to roll it from a 45 degree angle, horizontally, or vertically. With motion blur properties available, users can choose whether or not they have it enabled, and how much of it they want. Users can also choose between the number of rolls, which ranges from one to three. The amplitude parameter controls the appearance of the roll, which means that a positive value yields the inside of a cylinder look while a negative value will give it a bulgy look. What I like about this transition is how versatile it can be, as well as it’s possible configurations. I’ve used this a lot on entertainment pieces and it definitely enhances the production value. Impact Flare is a lens flare transition that moves across the screen while dissolving from the outgoing clip to the incoming. Users have the ability to control a variety of parameters including the color, start/end points, shape, fog, and halo. While I’m a fan of this transition for its dynamic movement and ease of use, it would be even better to have some visual options of the parameters, like fog and halo. Overall, I’ve tried other flare transitions before, and this one renders more quickly and is great for a quick flare transition without a lot of fuss. This transition will be frequently used on some upcoming projects. Film Impact Transition Pack 3 is a must have if you are a Premiere Pro user. In the time since these transitions have been available, I’ve seen great projects cut with this new pack, and you will have more creative options than before. Pick up this pack for $89, or all three packs for $179. When you open Zbrush, navigate to the TOOL palette in the upper right corner of the program. From here, click on the larger golden “S” icon that reads “SimpleBrush” beneath it in order to view all of the tools to choose from. Locate the tool that is called Zsphere (third row down on the far right side) and click on it in order to select the tool to make it active. Please note that in Zbrush, a “model” refers to a tool. This tutorial will remain using that same terminology. In the canvas you will CLICK AND DRAG with the mouse, and as you do so you will see a Zsphere appear and grow larger or smaller as you continue to drag the mouse. Once the ZSphere is a suitable size release the mouse and you will have created your Zsphere. The Zsphere may appear to be lop sided or not centered on your canvas, so let’s quickly go over how to navigate within your canvas window. Along the top tool bar you will want to select EDIT & MOVE which will in turn to DRAW. To move your tool, the first option is using the MOVE SCALE & ROTATE buttons located on the right vertical tool bar. Simply CLICK & DRAG on top of whichever navigation button you need in order to maneuver around the tool. Hold SHIFT in order to lock movements to 45 degree angles. This is especially important when wanting to get a perfectly straight-on or profile view of your tool. Head back to the top tool bar to keep EDIT on, and now switch MOVE to DRAW again. This will allow you to start building up and developing your Zsphere. By hitting ‘X’ on your keyboard, you will activate the shortcut key for SYMMETRY. By doing so, whatever you draw on the right side will be mirrored exactly the same on the left side. This is especially helpful when roughing in something like the human form. I will go into more detail specifically on using and mastering the symmetry transformation in a later tutorial. CLICK & DRAG on your main Zsphere now in order to create two symmetrically corresponding Zspheres. By toggling back and forth between DRAW MOVE SCALE AND ROTATE transformations, you will have the basic building blocks to developing your Zsphere. Here I developed a very crude stick figure person. After Effects has been the industry leading compositor, visual effects, and motion graphics application since its early days back in 1993. Back then, it was known as CoSA. This application has been used on small and large scale projects by post professionals across the world. Aside from that, After Effects by far has one of the largest communities than any other post production application on the market. One of the unique things about After Effects is that it can “interact” with 3D elements, but it is still a 2.5D application. In the last 21 years, this application can now handle the 3D pipeline thanks to third party developers and companies like Maxon. I want to highlight some of the third party plugins available to help you get 3D objects and/or text into After Effects. Founded by Zax Dow, Zaxwerks provides a plethora of 3D plugins for AE that can handle just about any 3D pipeline. Used by news broadcast and high end production companies, Zaxwerks’ two biggest plugins are ProAnimator and 3D Invigorator. ProAnimator provides the user with real-time 3D rendering, raytracing capabilities, image based lighting, real time ambient occlusion, and much more. 3D Invigorator has 3D text, modeling creation/import, and animation capabilities. Some of the difference between Invigorator and ProAnimator is that 3D Invigorator uses the AE keyframe system, as well as AE camera, whereas ProAnimator has its own integrated 3D animation system. It comes as a plugin for After Effects as well as a standalone application. It’s currently in its 8th version with more features being added per update. It currently retails for $499. In my opinion, I believe these are great plugins for creating incredible 3D animations as seen in their gallery. However, with limited training and a very small community embracing it, it doesn’t get as much praise as it should. Hopefully, that should change in the coming months. The 3D object plugin from VFX and AE guru Andrew Kramer, Element 3D was a plugin so revolutionary that it changed how artists handled the 3D pipeline. This plugin can not only import 3D models from popular 3D applications, but can also do much more. You can take a model of a a few buildings and duplicate it to create a city with little effort. This plugin also simplifies the animation process using its own render engine, in addition to taking advantage of After Effects motion blur and camera abilities. This plugin possesses the ability to easily create 3D text using text layers and masks for the basis. What makes this plugin so popular for 3D work, is the fact that it was used on creating the credits for Star Trek Into the Darkness. They also provide extensive training, taking you into the depths of the plugin. On top of that, it costs $149 with model packs ranging from $99-$200. I’ve used this plugin to create my new intro, and its updates make it a must have plugin for any artist. It’s currently in its 1.6 version, but will see a V2 update shortly. Cineware is the new plugin for After Effects CC, and allows users to import Cinema 4D scenes into After Effects. This plugin helps improve the 3D workflow, when, normally, users would have to export high resolution scenes from Cinema 4D to do further compositing inside After Effects. Dropping Cinema 4D scenes into After Effects allows users to interact with the scene as well as integrate into an AE composition. This plugin is available for Adobe Creative Cloud users, but the fact that something like this exist now only opens the door for new users of both programs. As great as the concept of this plugin is, it’s far from perfect. If you intend to use Cineware, you should have a beefy laptop or desktop, as well as a high end graphics card for those intense C4D scenes. There are plugins available for helping deal with Cinema 4D scenes, such as Cineware Proxy, which helps to speed up the workflow. 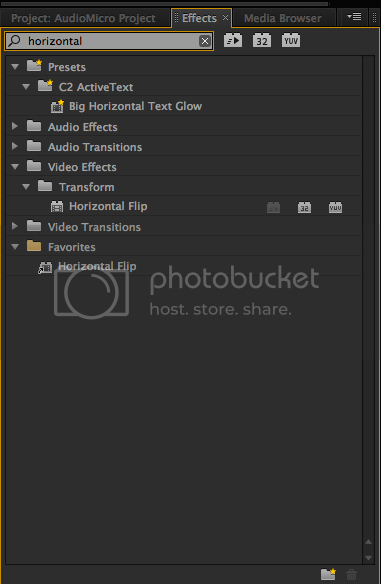 I believe that the Adobe AE and Maxon teams give a bright light into After Effects’s future. I can only see things getting better with time. Overall, these are some of the options for dealing with true 3D in After Effects. There are other options out there, but these three are currently the most popular of the bunch. Obviously, you can fake 3D in After Effects in a variety of ways, but with each new update, After Effects becomes stronger and more efficient for dealing with compositing, motion graphics, and 3D. Trapcode Particular, the 3D particle system created by Peder Norrby and sold under the Red Giant banner, is by far one of the most popular After Effects plugins ever created. With the plugin, artists have created incredible effects ranging from light streaks, bokeh patterns, smoke, fire, and much more. The in depth parameters and interaction with After Effects 3D camera easily enhances many compositions across the board. I’m going to share some tutorials I’ve come across that showcase the depth that Particular has to offer. In this tutorial, motion graphics artist Michael Park shows you how to create a procedural fire effect for your logo, similar to the Hunger Games: Catching Fire title sequence. Michael shows us techniques for using the AutoTrace feature for logos, as well changing After Effects bit color depth from 8 to 32 for a high dynamic range of colors. He also shows us how well Particular and Element 3D from VideoCoPilot work together. In this tutorial, author and motion graphics artist VinhSon Nguyen shows you how to create a galaxy nebula using Particular. VinhSon utilizes the After Effects camera, 3D lights, and null objects to guide the particles along with Knoll Light Factory and his Instafilm script to add finishing touches. You can get the result in the beginning of the video using this technique. The After Effect lights and 3D null objects are very instrumental in generating source points and paths for Particular to send particles across the screen. If you are looking to generate water without using practical effects, then this a tutorial to watch. VFX artist Dino Muhic shows us how to create water around a watermelon using Particular. Manipulating parameters in the Emitter, Particle, and Shading settings, you can generate water particles that can control and animate with other objects. Dino shares some great tips preparing your scene, as well as sculpting the water to look exactly as you want it. In an effect shown in the NBC series Heroes, one of the characters was able to visualize sound in passing light streams. Renowned motion graphics tutorial author Harry Frank shows us how to create this effect for our videos. Utilizing techniques such as motion tracking, 3D lights, null objects, and Particular, you can have your music turning into light in no time. Harry also shows us other parameters within Particular, such as Opacity over Life and Aux System, which help define the look of the particles. He then shows us finishing techniques to give it a cinematic look. As you can see from these tutorials, Trapcode Particular is not only a versatile plugin, but an industry standard plugin for many of the motion graphics and visual effects you’ve seen over the past few years. As a user of the plugin myself, it has helped me create many great mograph assets on a variety of projects, and still continues to be a plugin I go to when the situation calls for it. You can try Particular for yourself by downloading a trial, purchasing it as a standalone for $399, or as part of the Trapcode Suite for $899. The two objects needed to create your world is a plane (think of this as your floor) and your background object (think of this as a back wall). To create the plane, go to your cube object drop down menu and choose PLANE. By default, the plane will not be large enough, so go to your OBJECTS tab in your ATTRIBUTES window and increase the HEIGHT and WIDTH as needed. For your background object, go to the LIGHT OBJECTS drop down menu and choose BACKGROUND. Now, we need to add a basic color to both of the objects. 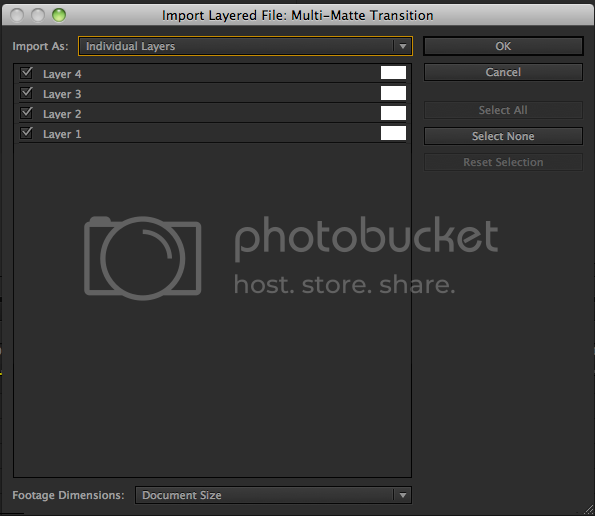 To create a material, go to the MATERIAL WINDOW and choose FILE>>NEW MATERIAL. At this point, double click on the new material, and under the COLOR tab go to TEXTURE>>GRADIENT>> and choose CIRCULAR. You will notice a color slider that adjusts the tone of the gradient. Set the swatch box to the left to pure white, and the swatch box to the right to a light gray. You can now CLICK & DRAG your material to both your PLANE and BACKGROUND. Attaching the color material to the objects will not create the desired effect you are looking for. In order to finish the world your object is living in, you must first composite the color over the objects correctly so the information is interrupted in the proper manner for the final image. First select the PLANE OBJECT in the OBJECT WINDOW, and then select TAGS>>CINEMA 4D TAGS>>COMPOSITE. Next, select your COMPOSITE TAG, go down to your ATTRIBUTES WINDOW, and check the box for COMPOSITE BACKGROUND (which should be the only option not checked yet). From here, select your COLOR MATERIAL next to your BACKGROUND object in your OBJECT WINDOW. Go down to the ATTRIBUTES WINDOW and change the PROJECTION type from UV MAPPING to FRONTAL. At this point you can see the world you created by TEST RENDERING the scene by hitting COMMAND+R. You will notice that there are no hard edges. Instead, you see an infinite white background for your object to live in. Additionally, your object is not showing any signs of a shadow. This is to save time on render speeds and keep the program running as smoothly as possible by default. To turn on the shadows, all you need to do is select your LIGHT OBJECTS from the OBJECTS WINDOW (first created in our 3 point lighting tutorial), and under the ATTRIBUTES WINDOW, change the SHADOW type from NONE to SHADOW MAPS (SOFT). This is the first of a series of blog posts explaining how to create basic 3D forms and composite them into your After Effects CC program. At first glance all the icons and tools can appear daunting, however in time you will come to discover the logical pattern in which they have been organized and find confidence in your usage of the application. For right now we are only going to focus on two icons along the top bar. The first one is the Freehand Spline tool which appears to be an inverted blue ‘S’ symbol. If you click and hold on the icon a drop down menu will appear with all the types of Freehand tools you can create with. You will want to choose the ‘A’ symbol for the TEXT tool. Once you select the TEXT FREEHAND tool you will notice a placeholder text will appear on your canvas. To control this text and change it to want you want go over to the ATTRIBUTES panel located in the lower right of your layout. Under OBJECT PROPERTIES you will first see the TEXT attribute and a box which you can populate with your own words and phrases. Now that you have your text saying just what you want it to, you have to give it some depth. To do this we are going to use NURBS (non uniform rational b-spline) to help us achieve this effect. To the right of the FREEHAND SPLINE icon is a green box icon which is labelled as the HyperNURBS OBJECT, click and hold down, and choose EXTRUDE NURBS. By definition, extrude means to “thrust or force out,” which is exactly what we are going to be doing with our text — we are going to force it out and mold a 2D form into a 3D form. Initially, when you select EXTRUDE NURBS you will notice that nothing has occurred to your text spline. This is because if you direct your attention over to the OBJECTS panel in the upper right of your window you will notice that the Text form and the NURBS are two separate items — they need to be combined together. To do this all you have to do is click and drag your text object onto the NURBS object in the OBJECTS panel. You will notice immediately that your text has taken on a crude 3D form that we can now mold as we see fit. There are numerous preset materials that come built in with the Cinema 4D program. To apply one to our text go to the MATERIALS panel near the bottom of the program and go to FILE >> LOAD MATERIAL PRESET >> choose the material you want. Once the material is chosen you will see it has been added to the Materials panel. To add it to our text simply click and drag the material onto the EXTRUDE NURBS. If you hit COMMAND + R on your keyboard it will create a quick render of your text showing you the clarity of your material. From there all that’s left is refining the text form itself. To do that go over to the EXTRUDE NURBS object in the OBJECTS PANEL, choose it, and go down to the ATTRIBUTES PANEL. Here you will see various tabs for modification — BASIC, COORD, OBJECT, CAPS, PHONG. By going through each of these tabs we will be presented with various sliders and adjustments to tweak and mold our font form to what you want including font type, depth, angle, caps, and more. G: On Wreck-It Ralph, your title is “Stereo Layout Artist,” could you explain what that title entails in your own words? Sean: A Stereo Layout Artist performs stereo layout duties. In case anyone is unfamiliar with 3D stereo films, the literal process of “stereo” is the creation of a pair of side-by-side images that are used to generate the illusion of actual “depth” in an image by slightly offsetting one camera from another hero camera. In a nutshell, this means in a digital world that the artist sets up the computer-generated stereo camera pair, which mimics the same camera settings and location in 3D space as the mono hero camera. The main difference between the mono camera and stereo camera pairs is that, like mentioned above, the stereo camera pair is horizontally offset from each other to create a separate image for each eye. This allows us to create the illusion of stereo depth through various means of delivery to the viewer, for example, by simply interlacing the image for a 3D monitor or through stereo image delivery to high-end 3D stereo projectors used in theaters. As well as stereo camera creation, a stereo artist will also set how much stereo depth is in each particular shot as well as do final stereo-related compositing (also known as stereo finishing) work to ensure that no stereo artifacts are present within the final-rendered 3D stereo images. For me personally, my job requirements as a Stereo Layout Artist also included a few other secondary duties, which included assisting in training additional artists for low-level image finishing, task-centric training demonstrations, Nuke tool development (utilized within both stereo and lighting pipelines), and Wiki-style training documentation. 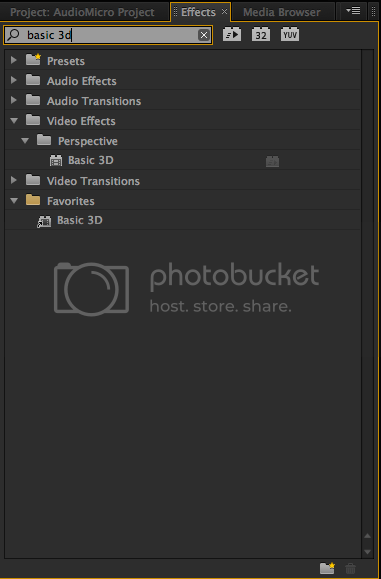 G: What type of programs do you use for Stereo Compositing? Are they standard compositing programs such as After Effects or Nuke, or is it something entirely different? Sean: Well, probably the most commonly industry-accepted node-based compositing package is Nuke, but there are others out there that can do some pretty awesome stuff. Fusion is another comp package along with several pretty cool proprietary comp packages that have been developed by various individual VFX houses. An example of this would be the Rhythm & Hues compositing package known as ICY (not publicly available outside their studio). After Effects can do some types of compositing, but it was originally designed as a motion graphics software package and is really good at that, but the majority of post-production VFX houses lean towards node-based compositing packages (such as Nuke) as their versatility and high-end control is significantly greater. After Effects versus node-based comp packages is a discussion some people will vigorously debate, but in my opinion, whatever tool is right for the current job is the one that you should use. G: 3D movie experiences seem to be holding steady over the last half a decade or so. Do you see this 3D movie experience staying around indefinitely, fading away entirely, or evolving into something different (virtual reality, etc.)? Sean: I see stereo as something that is here to stay. As you said, stereo films have been around for quite some time and if you look at the cyclical wave of how stereo films have come and go over the years, it hasn’t ever actually “disappeared”. When looking at compositing or effects-related job descriptions, you will see that more and more of them list stereo experience as a requirement. Major film companies like 3D because it does generate an additional amount of revenue that a 2D-only film otherwise might miss out on. Whether the future is in 3D stereo imagery or something straight out of the Star Trek ‘holodeck,’ I have no doubt that 2D films won’t be the only thing offered in the theatre from now on. G: What drove you to post production, and more importantly, what made you decide to become a compositor? Sean: Oh my, well, it was a bit of a convoluted path to be quite honest. When I was in grade school and through high school, I did a lot of web and graphic design. While in high school, I was recruited by the dean of my college art school. He showed me this awesome little animated short that they had made of two Kung-Fu strawberries fighting it out in a dojo and I was like “you can do that? !” Well, needless to say, I was hooked from then on. I started out training as a 3D Animator in college but a couple years into that, I realized I enjoyed fluid and particle sim effects work better. I focused on that for a couple of years and graduated, then went on to grad school which then ultimately led to my finding a unending passion for digital compositing. G: Editor is such an ‘umbrella’ term in my opinion. For myself in particular, I find it very difficult to find a specific niche — “Do I want to be a compositor, or how about matte painter, or animator, or lighting artist … maybe previs …” — The list goes on and I’m wondering if you have any tips on how someone could better hone their focus and discover the job that is right for them? Sean: Well, just to clarify, but the classification for an editor is actually not much to do with our VFX side of things. An editor is actually the person who does the literal cutting together of shots in a film/tv/music video and then the VFX house typically gets the edited imagery as they’re cutting the film. For those of us on the visual effects side of things, most of us are classified in the “artist” category, not an editor. Then within the artist category, it’s broken down for: animator, lighter, compositor, technical director, etc. That being said, it can be a difficult thing to decide. I mean, there are so many different facets of job options within the visual effects world to choose from. It would probably be best stated that one should pick an area of visual effects based upon where their strengths and interests are. Let me give some examples. If you are really good at programming and enjoy doing that, you could be a TD (technical director) who would create tools, pipeline structures, software engineering, etc for a studio. But if you are really good at painting, then you would probably be quite suited to be a matte painter. But if you enjoy drawing characters and designing them from scratch, then you might be a character designer or modeller. Maybe you enjoyed creating those little animated flip books when you were a little kid, shoot, maybe you enjoy that as an adult or you desire to act out different actions through a character, so you might then become a character animator. Or, if you are like me and enjoy some technical challenges as well as cheating reality through modifying and blending together different images, then you might want to become a compositor. These are just some of the many different jobs an artist can pursue within the visual effects world. It just depends on what the individual enjoys and is willing to really focus their skills on. G: In general, do studios look for a “renaissance man” who can do various editing tasks or do they prefer someone with one particular skill? Sean: In many ways, this question actually depends on the type of studio someone is working at. Sometimes, if it is a smaller VFX house, the employer is going to be looking to hire an individual who is good at many things (a generalist). One of the main reasons for this is because it is too expensive to hire one person to do one thing for every single aspect of a boutique-style visual effects pipeline. But then the opposite is true of larger post-production VFX houses. These types of studios are typically handling a very large bulk of visual effects shots where they will be looking to typically hire someone who is an expert in one specific aspect of visual effects, such as compositing, lighting, or animating. All this being said, it can definitely vary from studio-to-studio. It just really depends on what each VFX house is looking to accomplish with the resources that they are given. G: For people hoping to enter the VFX world, do you feel with recent events (R&H declaring bankruptcy, DreamWorks layoffs, etc) that this is a poor time to attempt to get in the industry? Is this an optimal time to try and get a job? Is Los Angeles still the best place to search for work or are there other areas with rising demand you can recommend? Sean: This is a bit of a tricky question. I don’t think that any time is a bad time to get into the VFX world. It is more about just making the decision and going for it. That being said, these current events within the visual effects industry, such as what you mentioned, are rather painful and saddening. A lot of really talented people have given so much to help establish places like Rhythm & Hues and sadly, the post-production visual effects industry is being affected by certain negative factors that are hopefully going to be addressed in the coming months and years. This being said, with the globalization of the visual effects industry, opportunities around the world tend to be quite plentiful. To someone who is starting out their career, there are several major hubs for our industry. Los Angeles, Vancouver, London, New Zealand, among other places do offer some great opportunities. Especially if you are willing to travel, then I say go for it! G: How did you get your big break in the VFX industry when you started out? Sean: Well, I worked on several VFX-related projects while in college. The summer before I went to grad school, I actually had an opportunity to work on a really fun independent film which suddenly opened several doors for me. Then, while in grad school, I was privileged to work remotely as a freelance VFX artist for several studios located both here in LA as well as up in New York. These opportunities helped to cascade into others and ultimately I was hired by Rhythm & Hues through their apprenticeship program and they moved me out here to Los Angeles, where I’ve lived and worked at a number of pretty awesome studios since then! G: With Wreck-It Ralph finished and coming out on Blu Ray in a couple of weeks, what projects are you working on now? Sean: Unfortunately, the projects I am currently on can’t be disclosed because the films haven’t been released yet. G: Do you have any final tips for someone who is trying to get established in the VFX industry that can help them stand out among the sea of other applicants? Sean: Make sure you have your best work on your demo reel. And don’t make it too long. Do the best that you can and never, ever give up! Focus on quality and always be willing to work hard with others. Stay humble and be kind to those around you. This is a very small industry and you never know who and when you will bump into in the future. Above all, love what you do!! Digital compositor, Diego Galtieri, was kind enough to answer some basic questions surrounding the role of a digital compositor. Diego talks about what the role of a digital compositor is, what type of programs and processes he uses as a digital compositor, and how to get a job in the industry. Diego currently is employed by Stargate Studios and has worked on television shows such as AMC’s The Walking Dead, Heroes, and most recently Doctor Who. With nearing a decade in the business you can review his whole body of work on the Internet Movie Data Base (IMDB). One of Diego’s most notable contributions to the compositing world is the iconic scene in the very first episode AMC’s The Walking Dead showing an aerial shot of the protagonist (the Sheriff played by Andrew Lincoln) trapped in a military tank while a swarm of zombies overtake the city streets. In creating a final image the process included multiple set extensions along with layering in numerous digital zombies to really bulk up the numbers. When a scene calls for a high volume of people, in this case zombies, it is not always in the budget to get all those actors on set, in make up, fed, and organized. That is where visual effects comes in and blends together live action with digital footage seamlessly saving time, money, and headaches. The process from filmmaking to post production in this instance would look something more like this: The raw footage is shot on set with the actors while a VFX supervisor guides the process on where to place green screens and leave negative space for his VFX artists to work. A digital matte painter would then go in and key out the green screen in the image and create set extensions and matte paintings to create the atmosphere and look the director was going for. Motion capture artists would bring in actors to act out the motions they require in order to create a digital zombie form, along with taking numerous stills of zombies already on set in full make up and prosthetics. From there a 3D artist would compile the data and still images and create his wire frame model of the zombie and utilize the motion capture data collected to bring it to life. It is at this point a digital compositor would receive the files from both the digital matte painter and 3D artist and begin to layer in all the extensions and 3D mo-cap models on top of the original raw footage creating one final seamless and realistic looking image — THAT is what a digital compositor does. He composites. He is the one who works with a post production team taking in all the various visual effects from all the various types of artists saved in all the various types of file formats, looks at it all like a puzzle, and begins to piece it all together. Once the digital compositor assembles the final image, it then goes off for color correcting and for sound mastering before the scene is considered finished. Post production and VFX is such a time labored and artistic field that works so unbelievably hard to convince you, the viewer, that what you are watching is “real,” or at the very least, visually compelling. In the amount of time I have spent learning the art of editing, compositing and motion graphics, I have come up with a way to breakdown how certain effects and transitions are created. They are usually created with combination of the following: keyframes, mattes and/or filters. To put this theory to the test, I am going to show you how to create a transition that uses multiple mattes, keyframes and filters inside Premiere Pro. Let’s get started. I have two clips in my timeline with a frame rate of 23.976 and the sequence is 720p. I’m going to make an edit at the end of the first clip for 12 frames and at the beginning of the second clip as well. If you are working with footage that is 30 or 60 fps, then you will want 15-30 frames from both of your clips so they equal one second. Next, highlight your edits and nest them into a sequence. For the second clip in your nested sequence, apply the horizontal flip filter on it. We’ll be using the Basic 3D filter down the line and whenever you rotate a clip 180 degrees, it will face a different way. If you have the horizontal flip applied prior to the Basic 3D filter, this will offset it. Let’s return to the main sequence. We will need a total of 8 video tracks to make this transition happen so let’s add a few more. To achieve this transition, I used a multi-layered Photoshop file, which I provided in 720p and 1080p. 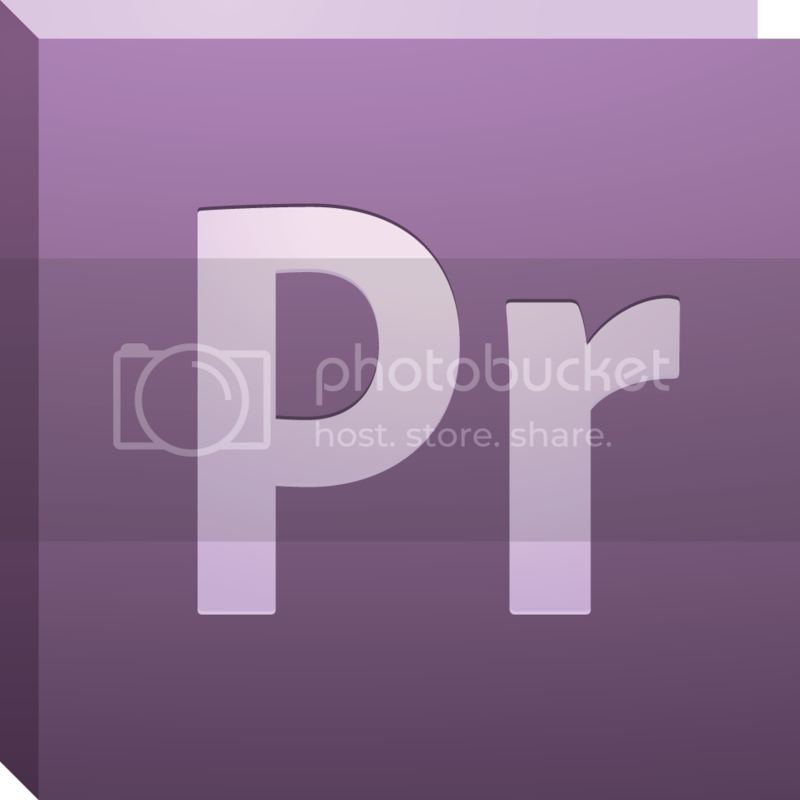 Import the file as individual layers when you bring it into Premiere Pro. Highlight your nested sequence. 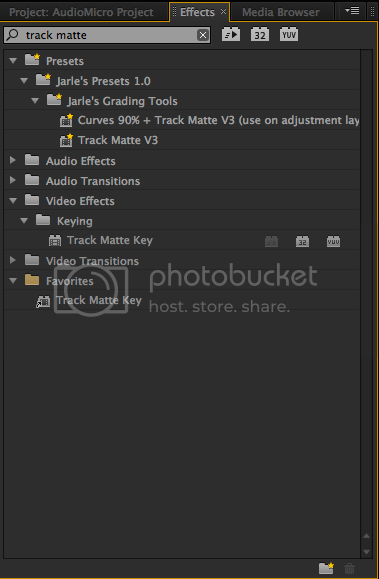 Go to the effects browser and type Track Matte. Apply the filter to the nest. Go back to the browser and type Basic 3D. Apply that to the nest as well. Place layer 1 from the Photoshop file on track 2. 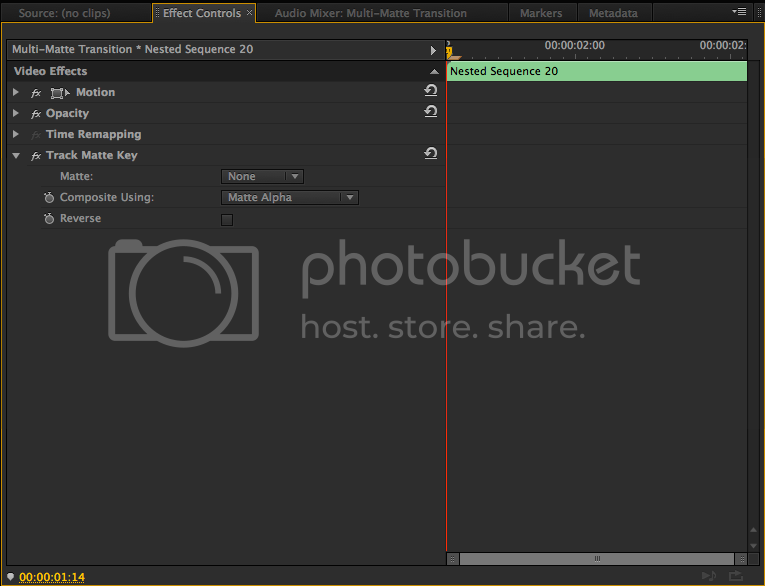 With the nested sequence selected, go to the effect controls panel. Set the matte option to Video 2. Set a keyframe for swivel at the beginning of your clip with a value of 0. Advance 12 frames forward and change the swivel to 90. Advance 9 frames forward and change the swivel to 180. To save time from reinventing the wheel, let’s highlight the nested sequence and layer 1. Hold down option and drag up to create a duplicate. Option drag layer 2 on top of layer 1 on track 4 to replace it. With your nest on track 3 selected, change the matte to Video 4. Move the first swivel keyframe 5 frames forward. Move the second swivel keyframe 1 frame forward and change the value to -90. Move the third swivel keyframe 1 frame forward and change the value to -180. Let’s highlight the nest and layer on tracks 1 & 2 and option drag duplicates onto track 5 and 6. Option drag layer 3 onto the layer 1 duplicate to replace it. Next, change the matte on the track 5 nest to Video 6. Shift the first swivel keyframe 7 frames forward. Shift the second swivel keyframe 3 frames forward. 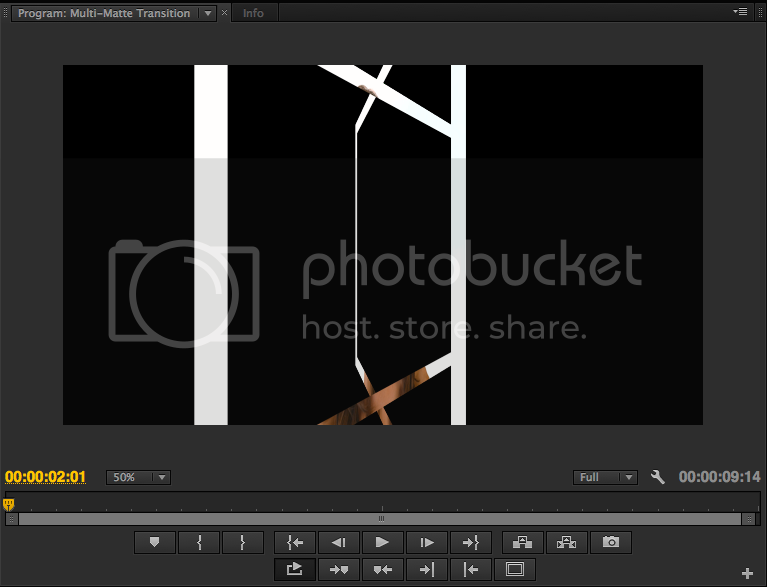 Shift the third swivel keyframe 2 frames forward. Let’s repeat the same steps I did above only this time highlight the nest and layer on tracks 3 & 4. Option drag duplicates onto tracks 7 and 8. Next, option drag layer 4 onto the layer 2 duplicate to replace it. Change the matte of the nest on track 7 to Video 8. Move the first swivel keyframe 2 frames forward. Move the second keyframe 1 frame back. Finally, move the third keyframe 1 frame forward. If you did it right your final result should look something like this. This transition was inspired by the MTransition 2 transition collection of MotionVFX. If you want a different shape than rectangles, you can create mattes in Photoshop to your liking. Third party plugins from Genarts and NewBlue FX tend to operate on these principles for most of their effects. It looks like this transition proved my earlier theory that most effects/transitions can be broken down into 3 essential elements: keyframes, mattes and/or filters. So the next time you see an effect you want to replicate, break it down with these parameters. I’m the NLE Ninja with Audio Micro asking you to stay creative.